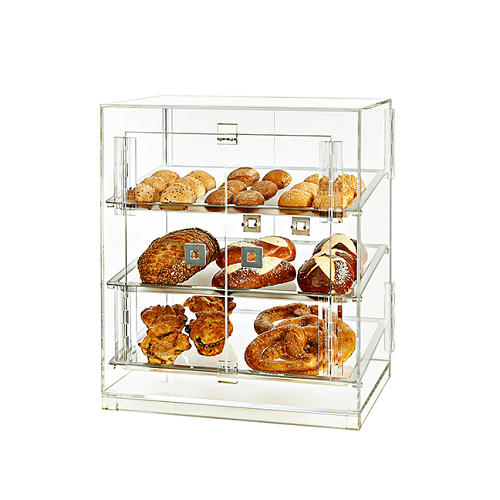 The Acrylic 4 Door Bakery Cabinet displays bagels, cookies, and more in a modern fashion. 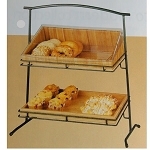 This bakery display is not only for the bakery, but it can also be used in convenience stores and other retail businesses. Double doors on the front allow your customers to select their own treats. Two double doors on the back make for easy refills. So keep plenty of extras to keep this acrylic display full. Staggered dowels allow you to angle the 3 removable trays towards your guests or place them in a flat position. Invest in your 4 door bakery cabinet and watch your sales climb. Add to cart!